One of the most difficult problems associated with climate change is the correct estimate of how much global sea level will rise over the coming century. Part of the answer to that depends on physical processes that take place in regions where the atmosphere, ocean and cryosphere interact. 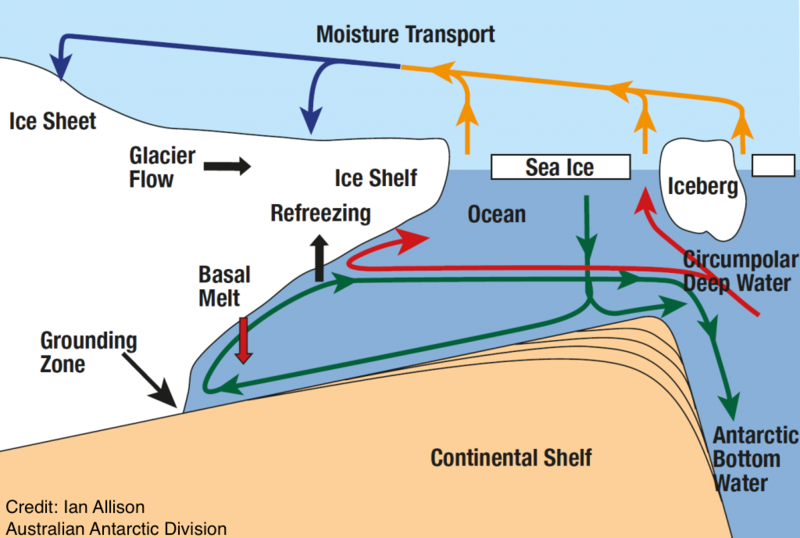 These processes are key players in controlling the melting of ice shelves, which are floating sheets of ice connected to a landmass. Since ice shelves buttress the glaciers behind them, once they break or collapse a large amount of ice can then be added to the ocean and contribute to sea level rise. My goal is to understand the role of different physical processes in controlling the circulation underneath ice shelves as well as the heat exchange between ice shelf cavities and the adjacent ocean. I am involved in the 2nd Ice Shelf-Ocean Model Intercomparison Project (ISOMIP+), where I am responsible for conducting the ISOMIP+ experiments using GFDL's ocean model (MOM6).